No images of Nickel Energy Installations. Nickel Energy is 100% Australian locally owned & operated company with friendly and honest customer service and advice. 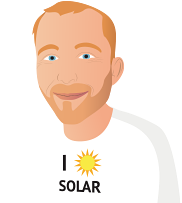 Experienced, fully qualified installers & electricians, installing grid connected solar since 2002. Quality products with distributors and warranty support in Australia. Nickel Energy installed a 2.5 kW system at a very competitive price using German inverter and panels. SolarQuotes suggested solar power suppliers where not local from where I live. We have few good solar power companies in this area, and to save in transport and motor vehicle movement I prefer to shop locally. I only had one reply from your 3 firms, so got 2 other quotes from locals & compared them with SAE. SAE representative was insisting on a reply within 3 days, said prices were going up felt pressured. Nickel was the best price & helpful. The firm from YAMBA WERE VERY HELPFUL, BUT PRICE WAS $800 dearer.